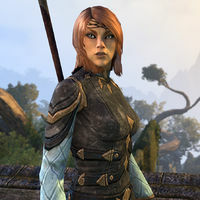 Aranias is a young Altmer woman and a new addition to the Veiled Heritance. Once known as the Rock Witch of Silatar, she has been manipulated into joining the Heritance and is one of their most valuable assets. She was assigned a guardian, Andur, who accompanies her throughout her travels in Greenshade. Aranias is able to shape the land into any form she wishes. She once lifted an entire ship out of the ocean, which frightened her parents into asking the Veiled Heritance for help. They left her alone on Silatar for a long time, and she grew lonely. When her parents returned from Summerset, they brought with them the leaders of the Veiled Heritance. 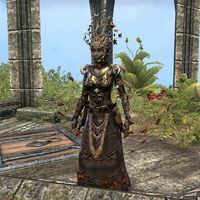 The leaders evaluated Aranias' powers when High Kinlady Estre forced her to kill a Bosmer woman. In The Witch of Silatar, it is revealed that Andur captured the woman and her husband, whom he killed personally. During the quest Throne of the Wilderking, Aranias leaves the Veiled Heritance and realizes her full destiny as the Wilderqueen. "Everything is so... very different. It's like I'm no longer a single physical form, but my being is spread out across the forest. She is the author of Aranias' Diary. This page was last modified on 9 August 2018, at 02:39.